#1. This week's number one is an international swingman Vafessa Fofana (198-92, currently plays in France). Fofana led Nantes to a surprising victory over the league leader C'Chartres (10-2) 81-71 in the French ProB (second division) last Friday. He was MVP of the game. Fofana scored 21 points and grabbed 7 rebounds. Hermine Nantes Atlantique (8-8) is placed ninth in the ProB. This season Fofana averages: 9.0ppg, 5.4rpg, 3.0apg, 1.3spg, 2FGP: 47.5%, 3FGP: 26.3% and FT: 77.8%. He is currently a member of the Ivorian senior national team. #2. Second place goes to former international center Aboubacar Aboubacar Hima (207-94, currently plays in Spain). Aboubacar Hima contributed to Carramimbre's victory against the closely-ranked Palma (11-10) 80-76 in the Spanish LEB Gold (second division) last Friday. He scored 8 points and grabbed 4 rebounds in 18 minutes. Carramimbre CBC Valladolid (12-9) is placed ninth in the LEB Gold. This year Aboubacar Hima's overall stats are: 4.4ppg, 4.6rpg, 2FGP: 51.6% and FT: 59.1% in 21 games he played so far. He played for the Ivorian national team in 2017. #3. The Ivorian player who performed third best last week abroad was former international center Cedric Bah (198-94, currently plays in France). Bah could not help Souffelweyersheim (20-2) to beat Saint-Quentin (21-1). He recorded 6 points and grabbed 5 rebounds. The second-placed Souffelweyersheim (20-2) was defeated 70-65 on the road by the leading Saint-Quentin in the Group A. They ended the series of eighteen consecutive victories. There are only four games left until the end of the Regular Season. So now every game will be critical. It's Bah's first season with the team. Bah has relatively good stats this year: 10.2ppg, 5.8rpg, 1.4apg, 1.2bpg, 2FGP: 52.6%, 3FGP: 23.3% and FT: 75.5%. He played for the Ivorian national team two years ago. #4. Forward Tiegbe Bamba (204-91, college: Portland St., currently plays in Iceland) was not able to help Grindavik (7-2) in their last game. Despite Bamba's very good performance Grindavik lost 96-100 in Reykjavik to the lower-ranked (#3) Valur. He recorded 15 points and grabbed 9 rebounds in 28 minutes. Bamba has individually a very good year with high stats. He averages: 15.1ppg, 9.2rpg, 2.5apg and 1.5spg in 11 games. Bamba has a dual citizenship: Ivorian and French. He is also Ivorian national team player. #5. International point guard Mouloukou Souleyman Diabate (181-87, currently plays in France) managed to help Sluc Nancy Basket Pro to win against the league leader Chorale de Roanne (13-4) 86-70 in the French ProB (second division) last Saturday. Diabate scored only 4 points and added 5 assists. It was the game of the round between two top 4 ranked teams. Sluc Nancy Basket Pro (12-5) is placed second in the ProB. It was his team's fifth consecutive victory in a row. Diabate's total stats this season are: 9.0ppg, 1.6rpg, 3.6apg and 1.4spg. He plays currently for the Ivorian national team. #6. Center Louri Frejus Zerbo (208-89, currently plays in France) contributed to an easy victory against the 12th-ranked Boulazac Basket (8-11) 93-75 in the French Jeep ELITE on Friday night. Zerbo recorded only 2 points in 7 minutes on the court. JL Bourg Basket (16-3) is placed third in the Jeep ELITE. It was his team's fourth consecutive victory in a row. This year Zerbo's total stats are: 0.8ppg and 2.0rpg in nine games. He is an international player who is currently on the senior Ivorian National Team roster. #7. International swingman Guy Landry Edi (202-88, agency: Promotex, college: Gonzaga, currently plays in France) was not able to secure a victory for Poitiers (6-11) in their last game. Despite his good performance Poitiers lost 88-95 in Bischwiller to the much higher-ranked (#5) Gries/Oberhoffen. Edi scored 10 points and added 3 assists in 26 minutes. It was his first game for Poitiers this season. It was Poitiers' fourth consecutive loss in a row. Edi is also Ivorian national team player. #8. Point guard Jean-Francois Kebe (185-94, currently plays in France) faced previously mentioned Cedric Bah in the French NM1 last game. 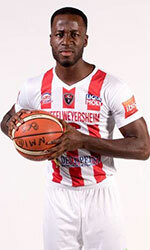 Kebe contributed to Saint-Quentin's victory against the second-ranked Souffelweyersheim (20-2) 70-65. He recorded only 3 points and added 3 passes. There are only four games left until the end of the Regular Season. So now every game is very crucial. Kebe has averaged so far 6.5ppg, 1.8rpg and 2.7apg. He plays currently for the Ivorian national team. #9. Former international forward Moussa Kone (203-93, college: Hofstra, currently plays in Spain) contributed to a Palencia Baloncesto's victory against the 14th-ranked Castello (8-13) 72-66 in the Spanish LEB Gold (second division) in Friday night's game. Kone scored 6 points in 16 minutes. Chocalates Trapa Palencia (12-9) is placed eighth in the LEB Gold. It was his team's first victory after six consecutive loses. Kone has averaged so far 5.7ppg and 4.4rpg in 21 games. He is another player who holds two passports: Ivorian and American. Kone used to play for the Ivorian national team four years ago. #10. An experienced center Mohamed Kone (211-81, college: Valparaiso, currently plays in France) helped JA Vichy win their game against the eighth-ranked ADA Blois (8-8) 89-74 in the French ProB (second division) last Saturday. He scored 9 points and grabbed 8 rebounds. Jean D'Arc Vichy Clermont Metropole (12-5) is placed fourth in the ProB. Kone has averaged so far 7.9ppg, 9.0rpg and 1.1spg. He is an international player who is currently on the senior Ivorian National Team roster. #1. Bazoumana Kone (193-G-93, college: Bremerhaven, currently plays in Germany) could not help Braunschweig (5-4) in their last game. Despite his good performance Braunschweig lost 89-103 on the road to the second-ranked EWE Baskets. Kone recorded 13 points in only a mere 14 minutes. This year Kone averages: 5.8ppg, 1.8rpg and 1.5apg in 13 games he played so far. He has a dual citizenship: Ivorian and German. Despite Kone's Ivorian passport, he previously played for the German university national team and is probably not eligible to play for the Ivorian team. #2. Mohamed Bamba (211-F-98, college: Texas, currently plays in NBA) managed to help Orlando Magic in a victory against the Indiana Pacers (35-19) 107-100 in the NBA on Thursday night. Bamba recorded only 3 points, 6 rebounds and 2 blocks in 13 minutes. The Orlando Magic has 22-32 record this season. It's Bamba's first year with the team. This year his overall stats are: 6.2ppg, 4.9rpg and 1.4bpg in 47 games. Bamba is another player who holds two passports: Ivorian and American. #3. Experienced Alain Koffi (207-C-83, agency: BeoBasket, currently plays in France) was not able to help Gravelines-Dunkerque in their game against Chalon/Saor (10-9) in the French Jeep ELITE. He recorded only 4 points. 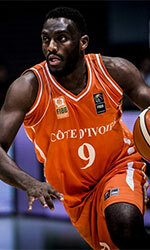 Gravelines-Dunkerque was crushed 91-66 on the opponent's court by the lower-ranked Chalon/Saor (#8). Koffi has relatively good stats this season: 10.2ppg and 5.7rpg. He has both Ivorian and French nationalities. #4. Jonas Bergstedt (208-C-91, currently plays in Hungary) was not able to secure a victory for TF Budapest (1-17) in their game against Alba (7-11) in the Hungarian A Division. Bergstedt scored 8 points and grabbed 9 rebounds. The bottom-ranked TF Budapest was crushed 102-78 in Szekesfehervar by the higher-ranked Alba (#11). It was TF Budapest's 16th consecutive loss in a row. Bergstedt has individually a very good season with high stats. He averages: 15.5ppg, 10.8rpg, 1.6apg and 1.1spg. Bergstedt also holds two passports: Danish and Ivorian. #5. Yoann Louis Folquet (185-G, currently plays in Canada) contributed to an University of Laval's victory against the Redmen (5-5) 73-65 in the U Sports on Saturday night. Folquet recorded 8 points and added 5 passes in 22 minutes. The University of Laval has a very solid 10-0 record this season. So far his team won all ten games in the Regular Season. Folquet has been at the team for five years. He has averaged so far 6.7ppg, 2.7rpg and 3.7apg in 10 games. #6. Samuel Amed Diomande (193-G-88, currently plays in Norway) led Ammerud Bskt to a victory against one of league's weakest teams Nidaros Jets 77-70 in the Norwegian BLNO in Sunday night's game. Diomande recorded 13 points and added 3 assists. This season he has very high stats. Diomande averages: 17.3ppg, 4.3rpg, 3.2apg and 2.2spg. He has dual citizenship: Norwegian and Ivorian. #7. Ange-Michel Kuo (203-F, currently plays in NAIA) contributed to a Presentation College's victory against the Viterbo University 65-59 in the NStar last Saturday. Kuo recorded 6 points and had 3 steals in 16 minutes. He has very impressive stats this year: 17.3ppg, 4.3rpg, 3.2apg and 2.2spg in 17 games.